M ark Jurish, Fiera Capital Inc.’s Executive Vice President, Head of Hedge Fund Investing and Seeding Strategies is developing a more constructive outlook on the opportunity set for hedge funds. 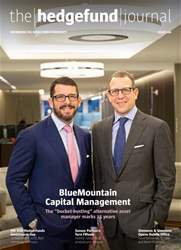 Clients have invested via three products: a customised, commingled fund of hedge funds product with a 25-year track record; US ’40 Act liquid alternatives (Fiera Capital Diversified Alternatives Fund); and hedge fund seeding, with a dedicated team that has seeded 26 funds through three prior vehicles. Jurish argues that, “hedge funds have been out of favour, for good reason, as it has been tough for them to compete with equity markets, and investors are looking to purchase things that are out of favour”. Jurish believes that multiple factors could power a resurgence in hedge funds’absolute and relative performance: “a recession and bear market have to happen eventually. Higher volatility and dispersion should be good for hedge funds, but it takes time. After a very long period with growth and FANG-type stocks leading the markets, equity value investing should come back into favour at some stage. Whether this is tomorrow, next quarter, or next year, I am not sure, but we do like select valueoriented long/short equity funds,”he says.